There is some doubt about this site being a motte and bailey castle....even an unfinished motte and bailey castle, as some sources suggest. 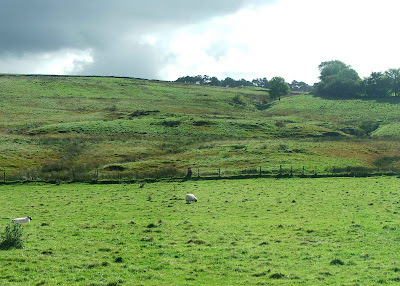 Local documents tell of two castles built in the Tebay area, to stop marauding Scots from passing through the area and onto Lonsdale and Kentdale further South. 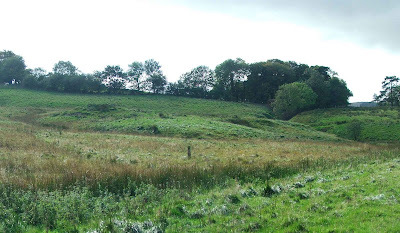 Castle Howe near junction 38 of the M6 motorway is undoubtedly an early medieval motte and bailey castle....the remains of the motte, ditches, banks and an extensive bailey area are all clear evidence of this. Walking into the field behind the farm, it took a while before I could even make out this earthwork feature. The old course of Birk Beck can clearly be seen in the field, some 50 yards or so the South of the current water course. The remains of the fortification, if that is what they are, would therefore have been about 20 yards or so from the waters edge, much the same as Castle Howe's situation. The motte, or enclosure, has an internal area of some 23 metres by 9 metres, and rises no more than four feet or so above the surrounding area. There are clear ditches to all sides of these remains, fed by a beck that runs from the top of the field above it. They were clearly water filled on the day I visited, and the ground around this feature was water logged and boggy. 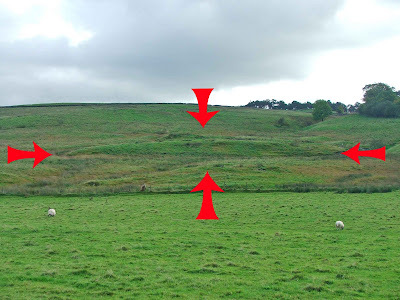 The photo above, shows the feature in the field to the South of Birk Beck. I wouldn't say that this would have been an ideal place to locate a fortification, as the area to the south is higher, as is the area to the West, making this a somewhat vulnerable site. If this is in any way connected with the motte and bailey closer to Tebay, it may have just been a watch post, possibly to warn of any Scottish incursions. Click on the images for full screen views.